Don’t always believe what you read in the newspapers… Its as true today as it was back in the 1946, today we read the goings on about Katie Price and the also latest gossip regarding the Kardashian’s etc …. we all know that most of these stories are generated by publicists and agents for these people to drive the hype and spin that are needed to promote these celebrities and their products, unfortunately in 100 years time when someone like me is researching about the history of Kim Kardashian, we only have what was written in news papers and promotional videos etc. to base this history on, and as we know today its not always totally true. 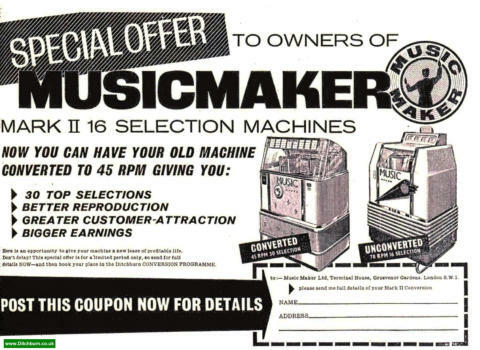 The same can be said for me now researching the early the early days of the Music Maker … I am neither a historian or a Jukebox collector, I am just passionate about keeping the history of Ditchburn alive. When i started this project there was very little information available and what i did find scattered over many websites in some cases contradicted itself, i am trying to keep the history on this website true and factually correct as i possibly can, When i started this site i was believing all the newspaper cuttings that i collected from 1946 onwards … In this last few months i have spoken with people that were actually working at Ditchburn ( Arthur Phillips and Chris Freeman ) and their stories regarding the early days of Ditchburn are amazingly similar, Chris Freeman worked for Ditchburn until 1963 and Arthur Philips worked from 1963 till the company closed in 1973. I had some very nice emails from Jukebox Authority, Mr Tony Holmes, who said to me that he didn’t believe that my website was completely factual, “but time will tell” and those wise words are so true, the more i dig for information and talk to people the more i find that the original articles may not be as factual as we thought they were. Lets start at the beginning … with Jack Hylton, Jack was an impresario, he had his fingers in many pies and was always looking at ways of promoting himself, and the jukebox was a medium that the public would hear his music and every Hylton record that was sold to be put on a jukebox, he would receive a slice of that pie, so it was important for him to promote the Jack Hylton Music Maker in a very positive way, also Jack Hylton never put just his own money into these projects he used investors that would fund his ventures, in the same way that his musicals and theatre production’s used investors that were hoping to make a handsome profit if the show was a success. Lets look at the original article back from 1946 that i and I’m sure many others took as factual from the early days, but in reality may have just been promotional propaganda to get funding and to please investors. The above all seems quite feasible and i believed it was probably true, that was until i spoke with ex-Ditchburn employees, Arthur Philips and Chris Freeman, both of them (note: they did not know each other ) said that were told by people that had worked at Ditchburn from the very beginning, that in 1945 Hylton thought that it would be great to get into the Jukebox market but unfortunately by the time Hylton had the Jukebox ready for production the war was over… most of the US troops had gone home and there was no demand for Jack’s Music Maker Jukebox, we have mentioned in the main History section that the Wurlitzer Mechanisms were flown into the UK by the US air force in crates marked as essential war supplies, this part appears to be true but the reality was there was not the 300 to 500 mechanisms that are stated in the above publicity article, in reality there were only approximately 24 mechanisms shipped by the US air force, the war was now over the troops had gone home and no more Wurlitzer mechanisms were shipped from the US … these 24 mechs and the crates they came in, built the first Jack Hylton MK1 Music makers, also the machine mech supplied from Wurlitzer was a very outdated mech which was no longer produced by Wurlitzer for the USA market at that time, and the cabinet was a simpler version of the Wurlitzer Victory cabinet and believed to be made from the wood from the crate the mechanism was shipped in, as wood at this time was in short supply in the UK, this also seems true based on Tony Holmes Mk1 cabinet as during the restoration you can see its carefully made from small pieces of wood by skilled joiners. From what both Arthur and Chris were told by early employees at Ditchburn, is that the reality was Jack Hylton and Hawtin’s could not sell even 24 of these MK1 Music Maker machines because of their outdated look … so Hylton asked a prominent artist if he could redesign the cabinet to give it a more modern styling ( the Fridge ) using the same MK1 mechanism inside. 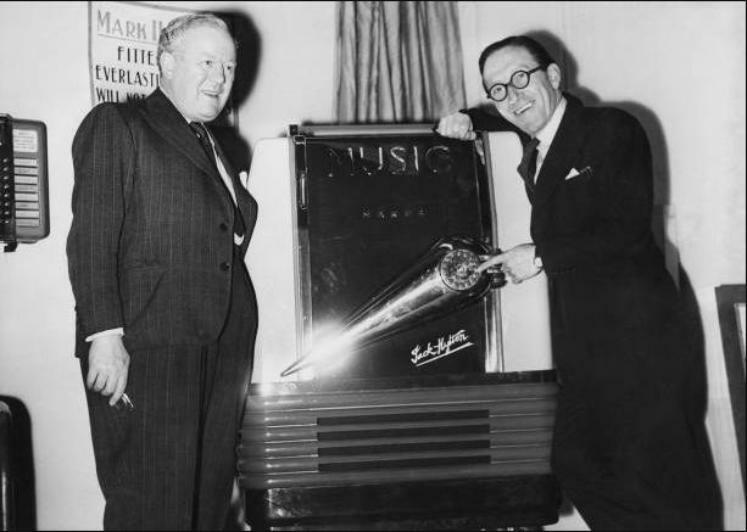 this is backed up by the 1946 photo of the MK2 music maker at the 1946 expo with Jack Hylton and Arthur Askey. 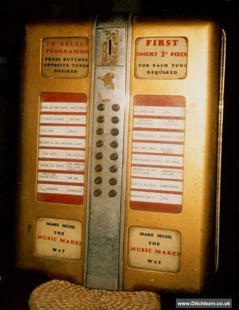 This prototype Jack Hylton MK2 Jukebox with the Jack Hylton Logo (above) is believed to be the only one ever made and never actually went into production, there are many surviving Ditchburn MK2 units currently owned by collectors but no known MK2 Hylton machines have been seen or have surfaced on the collectors market. so it is assumed that this prototype is long lost or destroyed although a wall box shown in the above picture has surfaced, although the known wall box is a slightly different design. I spoke with Chris Freeman about the wall box, because i have never seen a Ditchburn MK1 MK2 MK2R with remote functionality, all the ones that are surviving have no facility for remote connection or selection using a wall box. But Chris said that they did exist in a simple hideaway format, and he remembered servicing these in the early days. these were the MK2 H16/45 a 16 selection mechanism that had electromagnetic coils to activate the selection process instead of the push buttons, there were very few of these made, and they basically consisted of the standard 16 selection MK2 mech in a plain plywood box with no coin slot etc. so there were certainly were more wall boxes made during the early Ditchburn years. 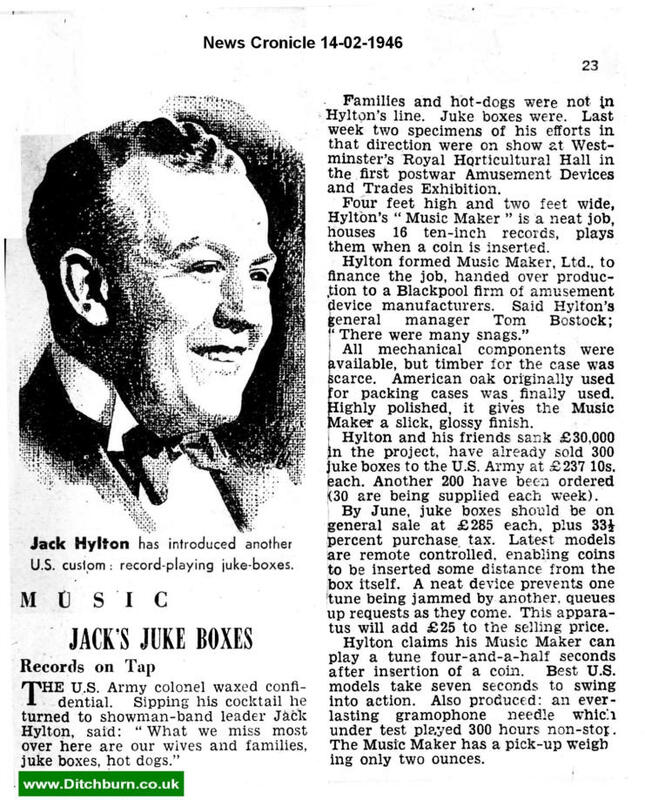 So returning to Jack Hylton, it seems the Music Maker MK1 and MK2 jukebox was not the commercial success that the press and Jack Hylton wanted us to believe, Hawtin’s of Blackpool who at the time had been manufacturing the boxes for Hylton also added them to their catalogue of amusement equipment. 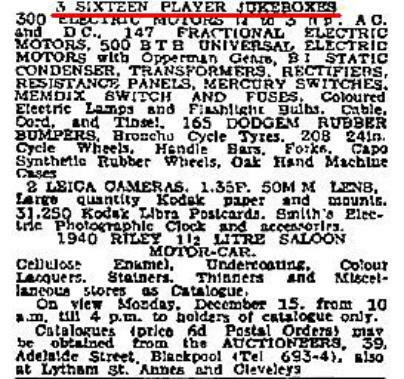 but it seems that they were also unsuccessful in sales, and it is well documented that Percy and Frank Hawtin wanted to get out of the amusement machine business and into false teeth, and on December the 16th 1947 they auctioned off the amusement division of Hawtin’s including 3 Sixteen player jukeboxes, believed to be the last of the 24 that were originally manufactured. 1947 The Arrival of Geoffrey Norman Ditchburn Again from conversations with Arthur and Chris it seems that Mr Ditchburn did not have any direct business dealings with Jack Hylton, at the time Mr Ditchburn was looking to set up a company to manufacture metal partitions and windows, but he could not do this openly as his agreement on his departure from Rowe Brothers was not to make similar products for at least 3 years. so he was looking at other ventures and the Jukebox interested him, apparently he liked the design of the MK2 music maker and approached Hawtin’s to use the MK2 design to produce his own version of the Music Maker Jukebox, Hawtin’s agreed and sold Ditchburn the design drawings for the cabinet and associated metal work and decals etc. This would later lead to legal issues with Jack Hylton as Jack had registered the Music Maker name, and Mr Ditchburn had carried on using the Music Maker name unknowingly as part of the design he bought from Hawtin’s. At the time one of Mr Ditchburn’s biggest problems was that there were no more Wurlitzer 16 player mechanisms left in the UK and post war import restrictions did not allow him to import any more into the UK. so in 1947 Mr Ditchburn decided to travel to the Wurlitzer headquarters in the USA and set up an agreement with Wurlitzer to produce the 16 player Mechanism under licence in the UK, this was agreed and drawings for the parts and castings were supplied by Wurlitzer to Ditchburn and Mr Ditchburn had all the mechanism and other parts made locally. a lot of people believe that their MK2 jukeboxes contain Wurlitzer 16 player mechanisms and it seems this is now not the case, especially as in 1947 Wurlitzer had stopped producing this type mechanism in the USA. GND” (Mr Ditchburn) as Arthur told me “he like to be called”… was a very shrewd business man and one of his habits was that he did not like to throw anything away, this became very apparent through the years … one of the advantages that GND had was that he never sold Jukeboxes only operated them, collected the rent replaced the records etc. 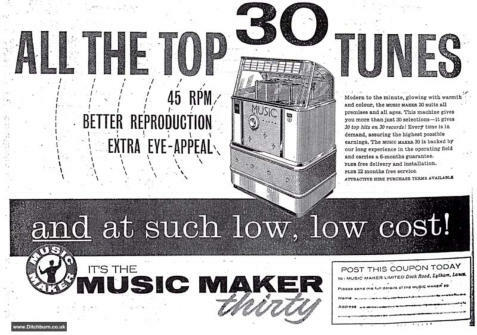 He felt that if a jukebox mechanism still had some life left in it he would use it, this was seen in the conversions of the MK2 machines to the MK2R in which the 16 play 78s MK2s came back to Lytham and were converted to the 30 play 45rpm MK2R these conversions happened around 1953 to 1958 as it was around this point that 45rpm 7” singles started to make an appearance the changeover to 45s took quite a few years in the UK as most homes only had 78rpm record players and people in the UK were initially reluctant to change due to the cost of the new players. 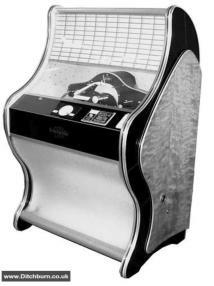 So the 16 player machines were returned the tops were cut off and a new wind shield style top was fitted, most people believe that the complete top was made from fibreglass, but we now understand it was only the initial prototypes were made like his, most of the conversions were plywood construction with a fibreglass sloping lid. the original 16 player mech was rebuilt as a 30 player selection with Ditchburn designed parts (Wurlitzer never made a 30 player mech ) after a new coat of paint these machines looked brand new and were then put back into business on sites around the country. 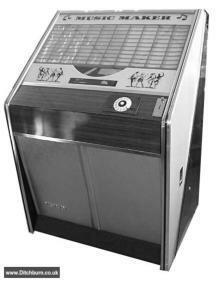 most customers thought they had got a brand new Jukebox … but the reality was it was just a refurbished and updated machine. This use of existing equipment trait of GND was also very apparent later during the Tonomat years, in 1957 Ditchburn bought 150 or more of the Tonomat 200 selection jukeboxes, but after 10 years or so these machines started being returned to the Dock Road factory because they looked out of date and not modern enough to compete with the newer Wurlitzer Lyrics that Ditchburn were importing from Germany, at that time the customers wanted the modern looking machines, so again GND decided that these old Tonomat machines still had plenty of life left in them, so he asked a cabinet company to put forward three designs to update the cabinet to a more modern Wurlitzer style, finally a design was chosen and in 1968 Ditchburn produced the new Music Maker 200 MK2 which in reality contained the insides of the 1957 Tonomat 200, again most of the customers thought they were getting a brand new machine which in reality was a new cabinet that contained the workings of an old 1957 Tonomat 200 Jukebox. Ditchburn’s business model continued like this over the years including the vending side which used parts imported from the USA and installed into UK manufactured enclosures. The alternative History of Ditchburn will continue at a later date. To Be Continued…..